Do you want to install performance nozzles in your 6.0 Powerstroke fuel injectors, or rebuild your own injectors? This is a 'must have' tool. Previously a tool to perform this special task was almost impossible to find. Most of the designs on the market were slow and awkward two piece assemblies. This fuel injector holding fixture is ready for the production environment and is in use by professional injector builders. 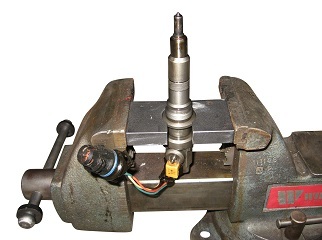 The injector slides in and out in a fraction of a second for quick and efficient injector disassembly and re-assembly. The upper and lower bodies of the 6.0L Powerstroke fuel injector are often quite difficult to get broken loose. Attempts to hold the upper injector body without a proper fuel injector holding fixture will almost certainly result in irreparable damage to the injector which will render it not even usable as a core. The price of the proper tool is likely less than the cost of a single core injector!